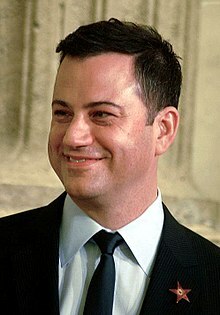 James Christian "Jimmy" Kimmel (born November 13, 1967) is an American comedian, voice actor, actor, writer, producer, musician, television host, and radio personality. He is the host and creator of Jimmy Kimmel Live!, a late-night talk show that airs on ABC. He is of German and Italian ancestry. ↑ "Monitor". Entertainment Weekly (1181). Nov 18, 2011. p. 34. This page was last changed on 22 November 2018, at 08:38.